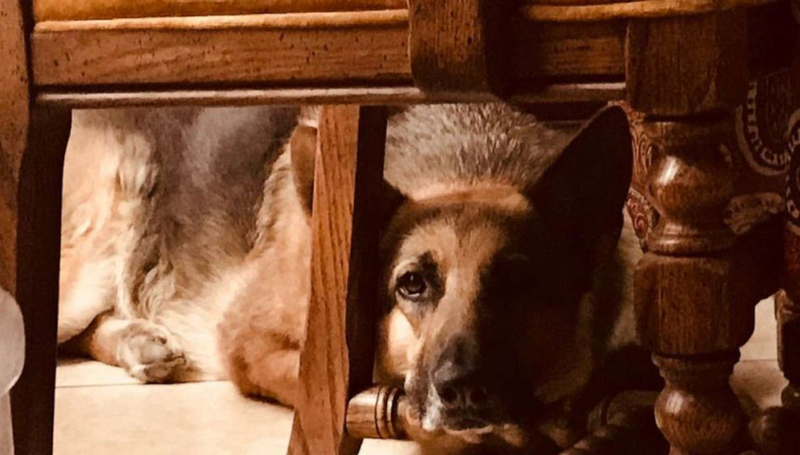 Usually, a mailman and the family dog are at odds, as many dogs see the mailman as an intruder into their space, but not so with a German shepherd named Gretchen. 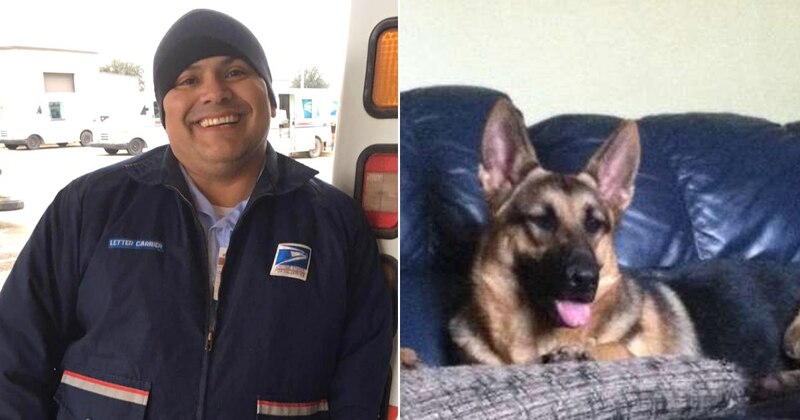 Gretchen had a special relationship with the family mailman, Fernando Barboza, who would bring the neighborhood dogs, including Gretchen, treats along his route. 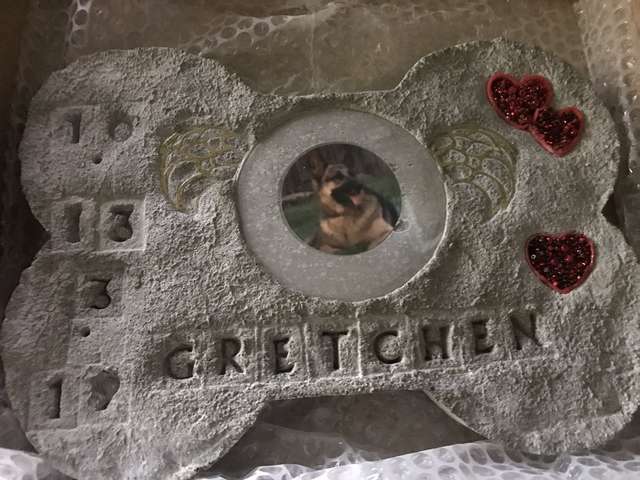 According to Gretchen’s owner Chris Cimino, Gretchen actually looked forward to the mailman’s daily visits. The two’s connection was so close that Barboza would actually stop by to say hello to Gretchen on his day’s off. So, you can imagine the heartbreaking news when he received word of Gretchen’s passing. 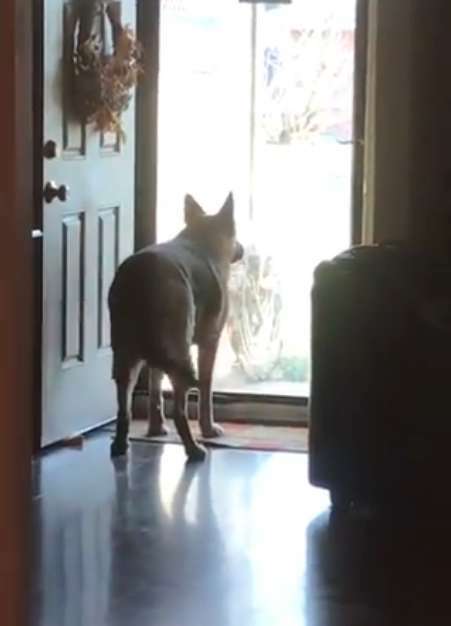 Here is the story of a family dog and her favorite mailman, and the one last request Gretchen had for her friend. 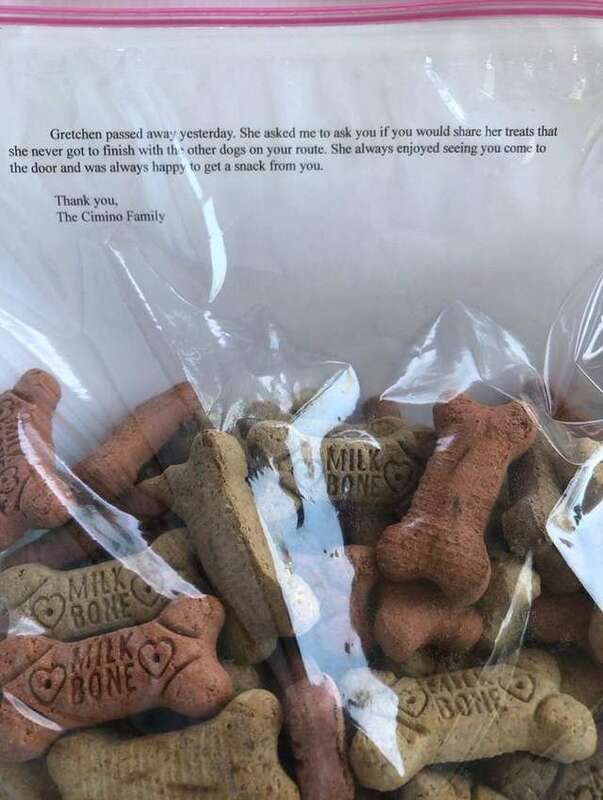 Along with the note, the family attached a bag of Gretchen’s dog treats. The tweet has since gone viral, getting over 874,000 likes and 186,000 retweets. 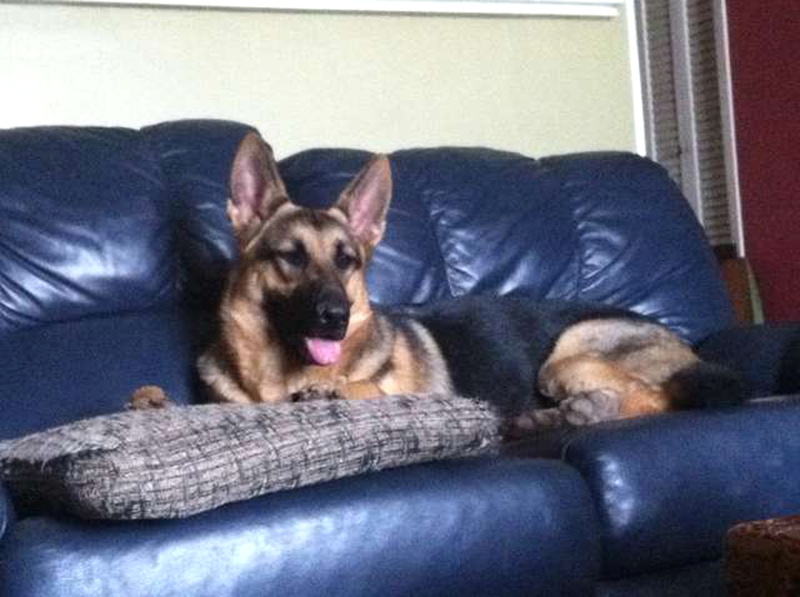 Gretchen’s story began soon after she was adopted by the Cimino family as a puppy. Initially, Gretchen was slow to trust, especially anyone outside the family. Overall though, she was sweet-but-shy. This was why her friendship with Barboza was so surprising. Barboza has always made an effort to include the family dogs on his routes. 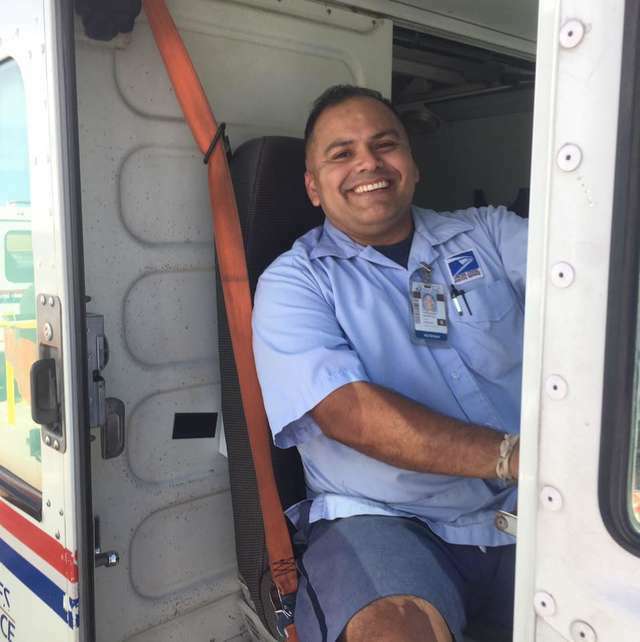 To do this, he carries a bag with treats with him while he is delivering mail. Every time he brings a package to the door of a home that he knows has a dog, he also brings along a treat to give to them. Barboza feels that if he is bringing something to the owner, he should also bring something for their dog. His relationship with Gretchen started off slow initially. Barboza tried paying extra attention to Gretchen every time he stopped by, calling her name and giving her a treat. Eventually his persistence paid off. Gretchen eventually grew to look forward to Barboza’s visits each day. She would even get jealous of the neighbor dogs when Barboza would give them a treat. Cimino didn’t know how to break the news to the mailman when she died. So, he decided to write Barboza a note and leave it for him in the mailbox. Upon reading the sad news, Barboza was immediately overcome with emotion. While difficult, Barboza was able to carry out Gretchen’s dying wish, handing out the treats in the bag to the neighborhood dogs. And each time he does this, he always tells them it is from Gretchen. Here is a video on twitter which shows Gretchen calling out to her favorite mailman and good friend.